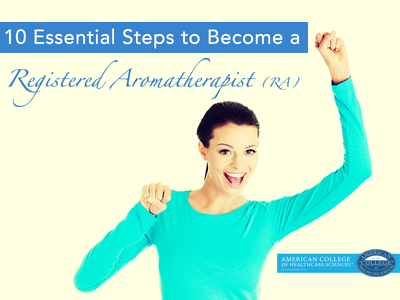 One of the most frequently asked questions I hear from ACHS students, graduates, and aroma-enthusiasts is: How do I become a Registered Aromatherapist (RA)? Next, you’ll want to make sure you’ve marked the upcoming Application Deadlines and Examination dates on your calendar. The ARC has these dates listed on their website here: http://aromatherapycouncil.org/?page_id=86. Here at the American College, students from all over the world have successfully completed their ACHS aromatherapy program and passed the ARC Examination and received the “RA” distinction. In fact, ACHS Aromatherapy graduates have a 100% success rate over five-years (2009-2013). Do you have questions about the ARC or the Exam? Ask me in the comments!